The 2 5 1 turnaround has been used throughout the history of music to "bring home" (resolve) both major and minor key progressions. It's a great sequence of chords with which to work on your improvisation skills. The minor key version of 2 5 1 (numerals: iiø-V-i) performs a similar function to the more popular major key (ii-V-I), but is governed by different harmonic "rules". This lesson is about breaking down those rules so we can hear, visualize and play through it confidently and musically. Start by watching the presentation below before moving on to the lesson, which includes ear training audio, backing tracks, licks and everything you need to jam your way through 2 5 1. Feel free to download the tracks below. They play through the minor 2 5 1 sequence in two keys - A minor and D minor. One track is orchestral, the other, slightly faster (60 bpm), in a bossa nova style. Let's start by getting to know the chord sequence so we know where to position our fingers on the fretboard in any key. We can build our chord shapes (see diagrams below) on these root positions. So i is our tonic or "home" in minor keys. If the key was A minor, we'd position that 1 chord root on A, either on the 6th string (5th fret) or 5th string (12th fret or open) and then visualize the ii and V chord roots in relation to that. The ø symbol (superscript circle with a line through) means the chord is "half diminished". This is another way of saying "minor 7 flat 5" (a minor 7th chord with a flat 5th), which is why you'll often see the chord abbreviated as m7b5 (e.g. Bm7b5 or B half diminished). This chord occurs naturally in the harmonic and natural minor scales. 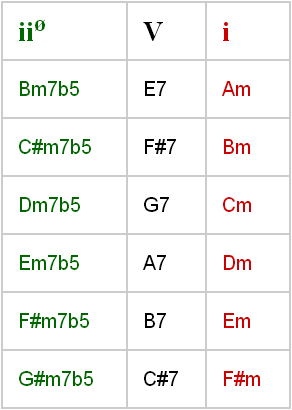 This is the chord type most commonly built on the ii root in minor keys. The first step in being able to improvise confidently and melodically through chord changes is to practice targeting chord tones. You'll later color these chord tones by wrapping scales around them. By using chord tones as the target notes of your phrases, you'll keep your solo/licks connected to the backing music. Think of it like connecting the dots to create something meaningful. Using the backing tracks from earlier (you downloaded them, right? ), start by playing just one chord tone per chord, moving on to two and three tones per chord as you become more confident. This is known as arpeggiating the chord changes. As mentioned in the video, the most convenient way of playing through minor 2 5 1 is to use the harmonic minor scale. It works over all three chords because the notes of these three chords exist within the scale. This means you can use the same scale pattern over all three chords as all three chord patterns exist within it. For example, in the key of A minor, A harmonic minor would cover Bm7b5, E7 and Am. And, as with all minor progressions, remember to add in some minor pentatonic and minor blues phrases occasionally. 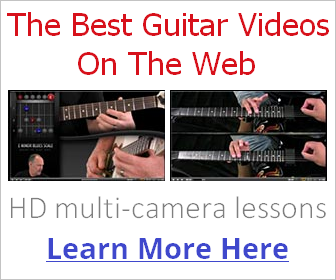 I hope you found this lesson valuable and enjoyed jamming!